You are currently browsing the tag archive for the ‘The Cassini Division’ tag. I have a confession. Back in the summer of ’03 I was living and working in Edinburgh. I lived out of the Central Library, just opposite the Royal Scottish Museum where I worked in a restaurant. I would take out fourteen books at a time and read them over a month or so, then return them for the next load. Those were pleasant days. I recall taking out Ken MacLeod’s The Cassini Division. I remember reading it. To be honest though, I have no memory what it was about at all. I am not even sure I finished the book. Not an auspicious start for a review, is it? 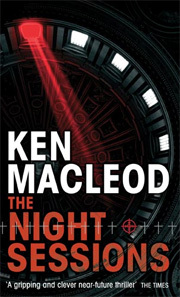 In The Night Sessions MacLeod maps the conflicts of our time, a diabolical festoon of resource wars and radical religious fudamentalism, on to a near-future society where the Western world underwent an event known as The Rejection. All forms of religious belief have been driven underground. A brutal, second Enlightenment took hold, America was swallowed in a destructive civil war and artificial intelligence escalated the spread of the conflict. John Richard Campbell is a young man fascinated with robotics. His work in a New Zealand preserve for animatronic models has given him an interesting outlet for his religious beliefs. He has begun to proselytize to his charges and what’s more, they are listening to what he has to say. When a secret sect in Edinburgh hears of him, Campbell is initiated into The Free Congregation of West Lothian. During the same visit, he meets a virtual reality dj Dave Warsaw and his partner Jessica at a club night in a former church. Campbell is repulsed and secretly intrigued by the orgiastic scenes created by Warsaw’s mastery of music and image. His faith has hidden him from such activities, a faith that makes him especially vulnerable to manipulation. A year passes and a series of murders in Edinburgh begin to rise tensions throughout the secular world. The targets are clergymen, former soldiers in the Faith Wars, with hints of inter-fundamentalist cell reprisals. Adam Ferguson leads the investigation, using bleeding edge technology to identify patterns in the murders, compile every scrap of data on file regarding the victims and their surroundings. However, he finds himself confounded by the complexity of the case. There are also fears of a much great attack at the secularist nations, so thoroughly denuded of religious faith that Ferguson has to remind his officers out of courtesy to refer to the murder victims by the title of ‘Father’, or ‘Bishop’, and not the prefix ‘Citizen’. MacLeod’s novel is a vast spider-web of ideas and supposition as to the future course of our society. The ‘Rejection’, I am sure sounds like Richard Dawkins’ fondest fantasy, but the story does not shy away from depicting the overzealousness of the anti-religious factions in this new world. His vision of future developments in surveillance technology and A.I. is also exciting and playful. Ferguson’s robot Skulk is more a partner than an investigative tool, complete with a winning sense of humour. I also enjoyed the familiar sights of Edinburgh being mildly tweaked to fit this depiction, despite surviving catastrophic sectarian conflict. MacLeod’s characters are for the most part Scots. There is in fact quite a large cast. The prologue that introduces Campbell serves to fix him in the reader’s minds before his eventual return in the latter-half of the book. If some of this sounds familiar, perhaps you are a fan of Ron Moore’s Battlestar Galactica, which also had the premise of a futuristic society running headlong into a conflict with fundamentalist religion. The difference is MacLeod’s book has balls. The ending is much more satisfying. Yes, I am still bitter. This is a book that I will have no trouble remembering. A thrilling and inspiring read.